Probably the most acclaimed Polish TV series long ago was 4 Tankers and a dog. It was a war movie for the youth about a tank crew whose incredible deeds greatly contribute to winning the war by the allies. Adults were fascinated, too, not only in Poland but in all Eastern block countries, including Soviet Russia. The actors became celebrities and the series gained the cult status. Nobody cared it contained a lot of communist propaganda. I watched all episodes and read a thick book a few times. The game of 4 tankers was our fav during free time in kindergarten and later. In games, everybody wanted to play the youngest and the most likeable crew member who gradually becomes the tank commander. Paradoxically, my fav episode was about the tank being hit in an urban skirmish and the crew landing in hospital with severe injuries and burns. There is no fighting, the atmosphere is quite relaxed despite initial death threat and pain. A scene showing how the tank commander chooses his new crew men at the recruitment camp. zterej pancerni i pies (Polish pronunciation: [ˈt͡ʂtɛrɛj panˈt͡sɛrɲi i ˈpʲɛs], Four tank-men and a dog) was a Polish black and white TV series based on the book by Janusz Przymanowski. Made between 1966 and 1970, the series is composed of 21 episodes of 55 minutes each, divided into three seasons. It is set in 1944 and 1945, during World War II, and follows the adventures of a tank crew and their T-34 tank in the 1st Polish Army. Although both the book and the TV series contain elements of pro-Soviet propaganda, they have achieved and retain a cult series status in Poland, the Soviet Union and other Eastern Bloc countries. 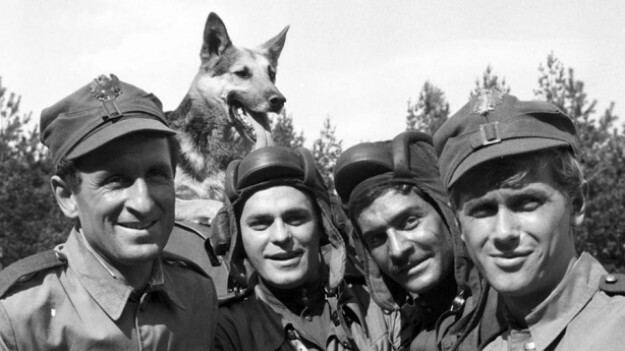 The T-34-85 tank Rudy (Ginger) with the identifying number "102", a German Shepherd dog from Siberia Szarik (pronounced "Sharik" - little ball in Russian, a nickname in the vein of "furball"; in Polish the word is similar to Szary meaning gray and szalik meaning scarf) and to a lesser extent the crew Jan Kos, Gustaw Jeleń, Grigorij Saakaszwili, Tomasz Czereśniak, and their commander and mentor Olgierd Jarosz, as well as other heroes of the series, have become icons in Polish popular culture.